I just purchased World of Warcraft for my pc. I have no idea what the other three dics are for that came in the box. There are not any key codes on the three discs and nothing happens when I put them in my laptop. The white sticker has the CD key that you would use to activate your account. (Here it is blurred/greyed out for obvious reasons). If you bought the game and it doesn't have these sleeves (or something similar with a CD key) then you probably got a copy or something that's not legitimate. You could always try to call Battle.Net support for help too, which I would recommend heavily. Side note: You don't actually have to purchase the physical game disks. You can go to the Battle.Net store and purchase a authorization key that will let you create an account, download and install the game and play. Not the answer you're looking for? Browse other questions tagged pc world-of-warcraft or ask your own question. How to choose race in World of Warcraft? How do World of Warcraft referrals and the free month work? Are World of Warcraft quests linear? Stuck on “Checking for updates…” when installing World of Warcraft? 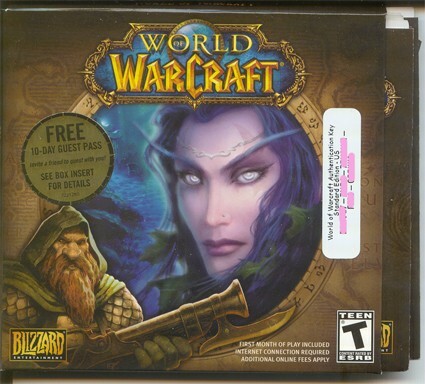 Can I install World of Warcraft from a disc? Does the old expansions count as a paid copy of the game? How do I get World of Warcraft to install via the disc and not the internet?